I also download SQL Server 2012 from Microsoft downloads and while installing SQL Server 2012 data platform I tried to take some notes. 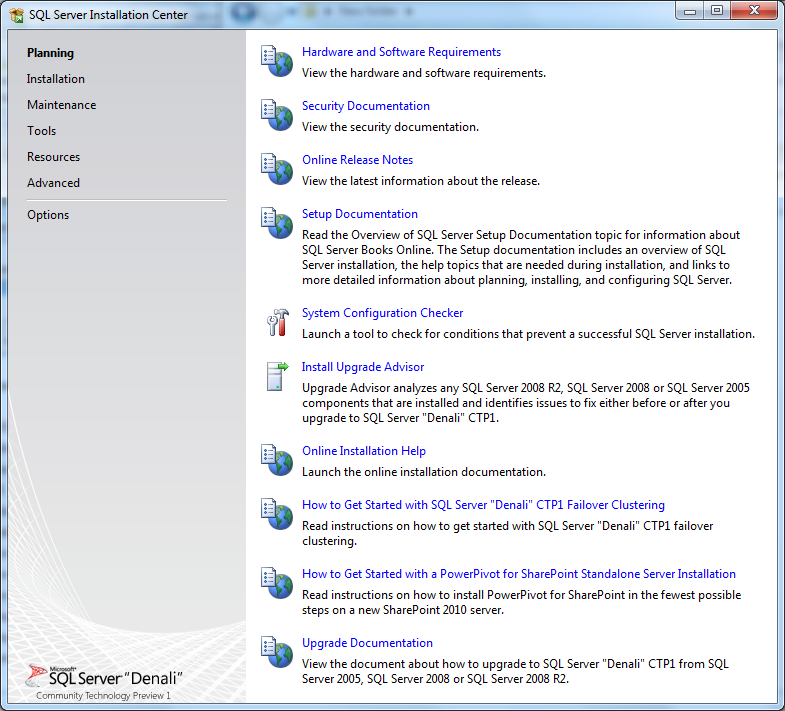 I hope SQL Server database professionals like administrators and T-SQL developers find my SQL2012 setup notes useful. Please keep in mind that, for this tutorial I install Microsoft SQL Server 2012 on Windows 7 operating system. Windows XP is not supported for SQL Server 2012 installation as an operating system. Please refer to Microsoft SQL Server 2012 Requirements for more information. I choose path "D:/SQLServer2011" for Microsoft SQL Server 2012 setup files extraction target path. 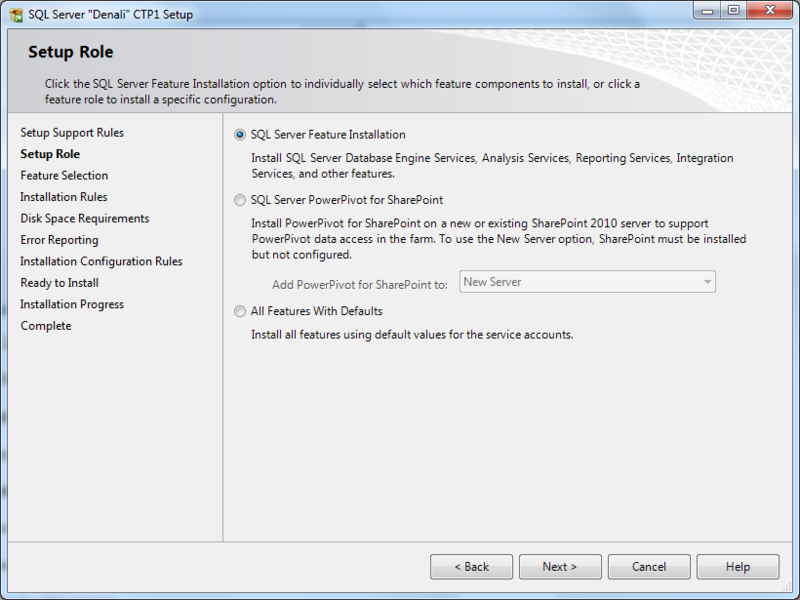 If you check the requirements you will see that PowerShell 2.0 is required for Microsoft SQL Server 2012 installation. Please refer to guide How to Check Windows PowerShell Version Installed on a Computer for more detail and alternative methods to check the version of installed PowerShell tool on your PC. 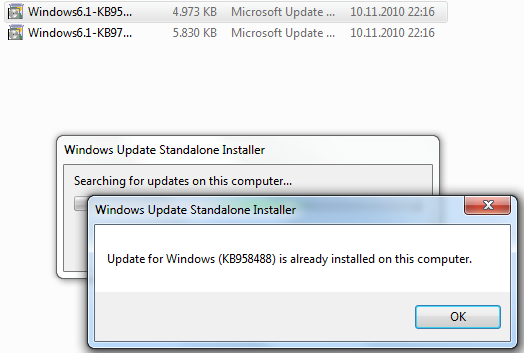 Here as seen in below screenshots, the KB958488 and KB979900 were already installed on my SQL Server 2012 computer. 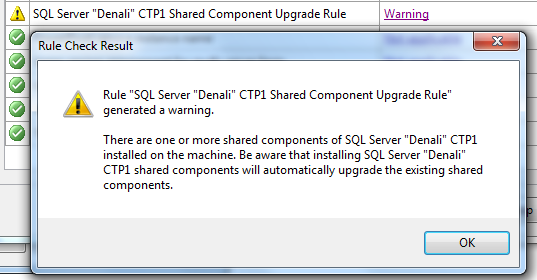 Unfortunately SQL Server Upgrade Advisor for SQL Server 2012 code-name Denali is not available for CTP 1 release. 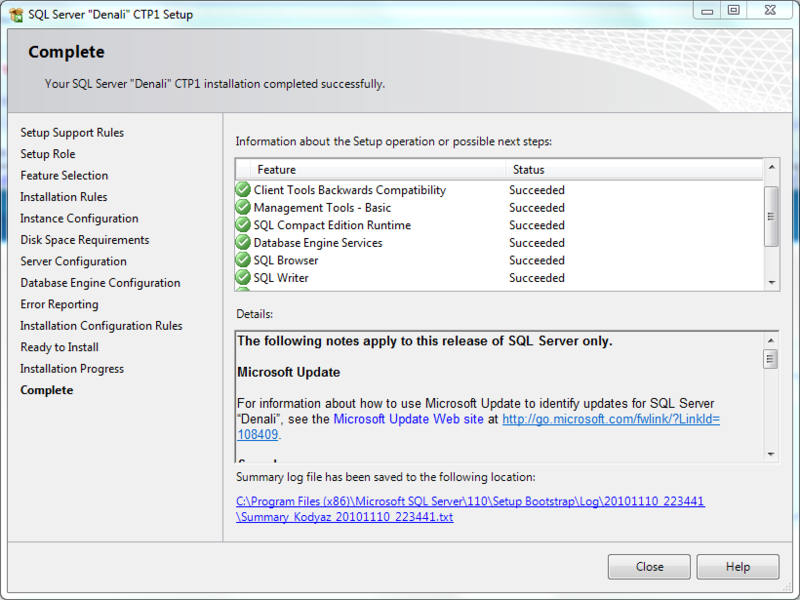 After you are ready for installing Microsoft SQL Server 2012 Denali CTP 1, you can switch to Installation tab from the left side menu of SQL Server Installation Center. 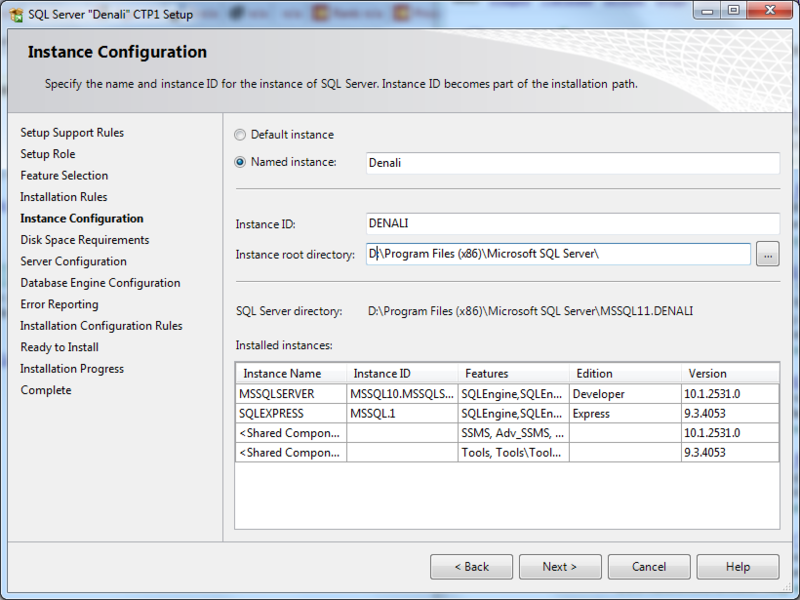 Click on New SQL Server stand-alone installation or add features to an existing installation. Then Setup Support Rules will be executed to identify problems that might occur when you install SQL Server Setup support files. Before continuing to installation process, the failures listed must be corrected. Here is the detailed report. NoRebootPackageDownLevel This rule determines whether the computer has the required update package that ensures that the computer will not have to be rebooted because of the Microsoft .NET Framework 4 installation. Not applicable This rule does not apply to your system configuration. MediaPathLength Checks whether the SQL Server installation media is too long. Passed The SQL Server installation media is not too long. NoRebootPackage This rule determines whether the computer has the required update package that ensures that the computer will not have to be rebooted because of the Microsoft .NET Framework 4 installation. Passed This computer has the update package that ensures that the computer will not have to be rebooted because of the Microsoft .NET Framework 4 installation. RebootRequiredCheck Checks if a pending computer restart is required. A pending restart can cause Setup to fail. Passed The computer does not require a restart. SetupCompatibilityCheck Checks whether the current version of SQL Server is compatible with a later installed version. Passed Setup has not detected any incompatibilities. 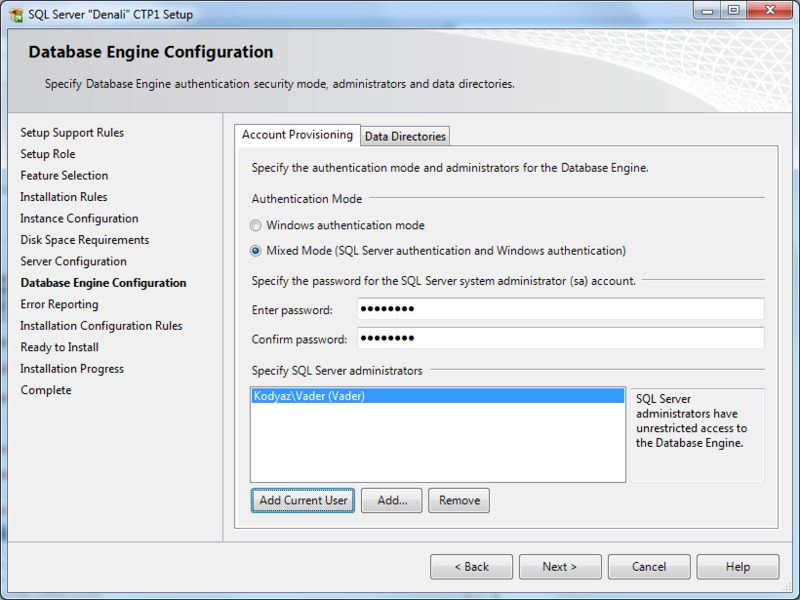 The SQL Server 2012 Setup (Denali CTP1) requires you to enter a Microsoft SQL Server 2012 product key or to specify a free edition of SQL2012. The possible MS SQL Server 2012 free editions are Enterprise Evaluation, Express and Express with Advanced Services. I prefer to use Microsoft SQL Server 2012 Enterprise Edition so I select Enterprise Evaluation from dropdown list. 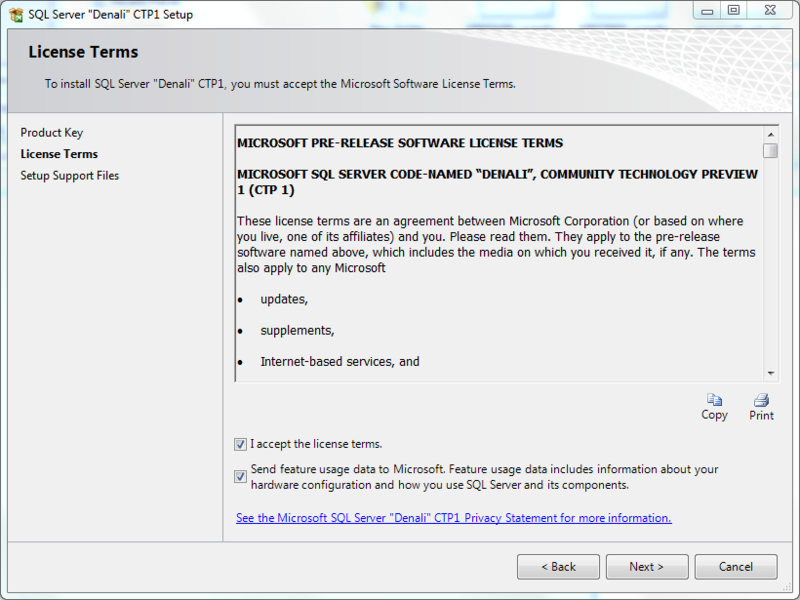 You must accept the license terms in order to continue to Microsoft SQL Server 2012 installation (SQL Server Denali CTP). 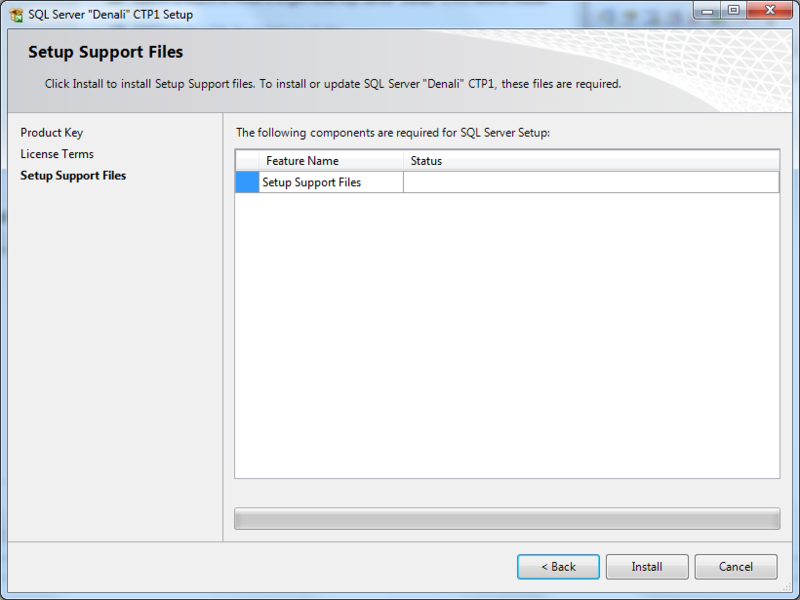 Click Install button to install SQL Server 2012 Setup Support files. 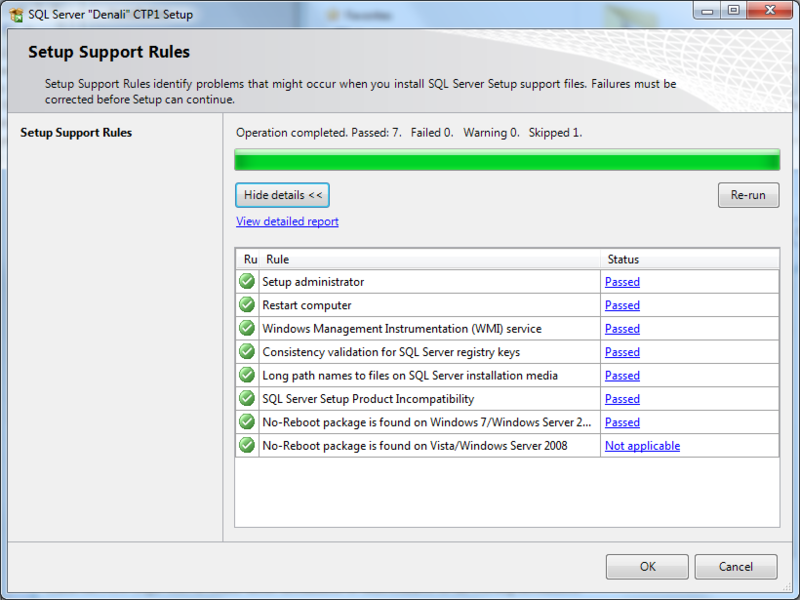 The Setup Support Rules again check the current system for possible failure reasons. As you see below, I got a warning about the Windows Firewall. And others are Passed. Let's start with passed criterias. Bids2008InstalledCheck Checks if any of SQL Server 2008 Business Intelligence Development Studio installation exists. Passed SQL Server 2008 Business Intelligence Development Studio is not installed. 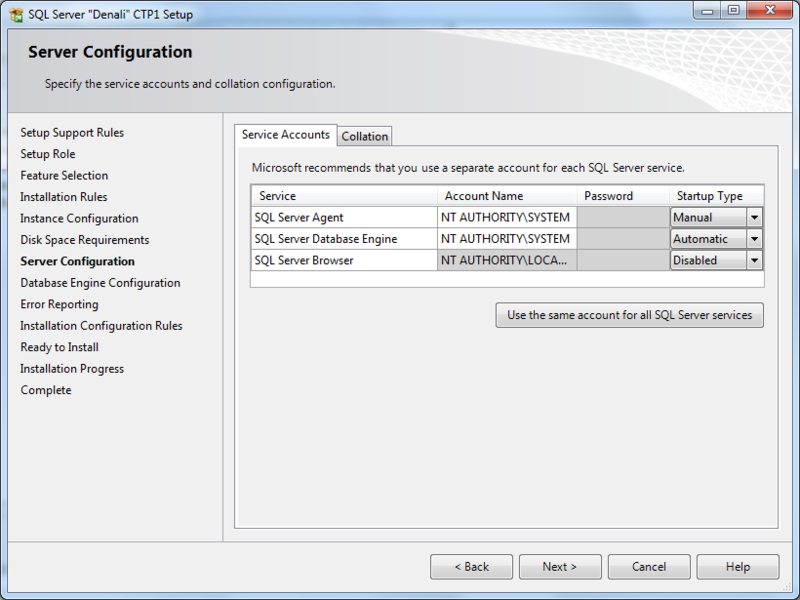 DenaliCTPbyCTPSxS This rule determines whether an instance of SQL Server "Denali" CTP0 exists. 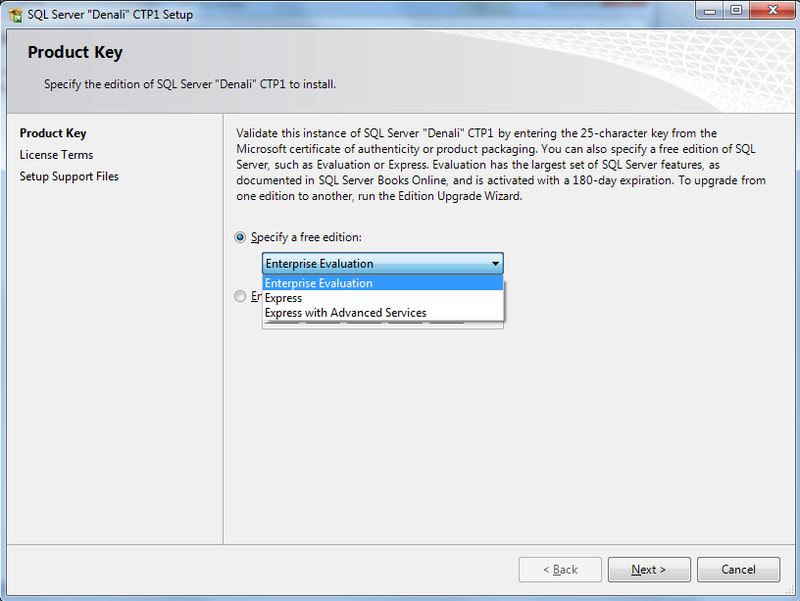 Passed SQL Server "Denali" CTP1 can be installed side by side with the existing version of SQL Server. FacetDomainControllerCheck Checks whether the computer is a domain controller. Installing SQL Server "Denali" CTP1 on a domain controller is not recommended. Passed This computer is not a domain controller. 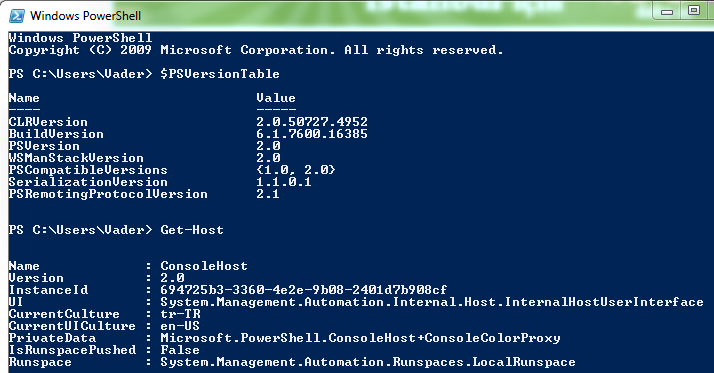 FacetPowerShellCheck Checks whether Windows PowerShell is installed. Passed Windows PowerShell is installed or not required. FacetWOW64PlatformCheck Determines whether SQL Server Setup is supported on this operating system platform. 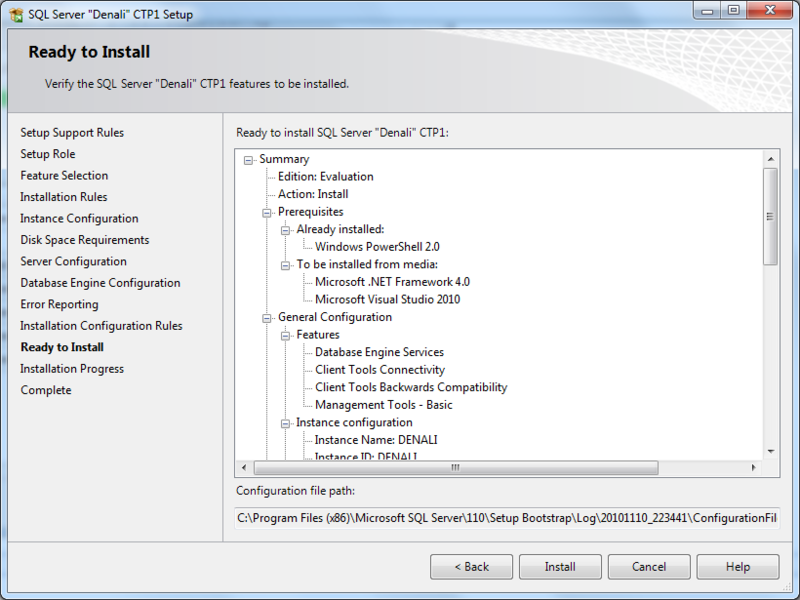 Passed SQL Server Setup is supported on this operating system platform. FusionRebootCheck Checks if a computer restart is required because of broken fusion ATL. A pending restart can cause SQL Server Setup to fail. Passed The computer does not require a restart. PerfMonCounterNotCorruptedCheck Checks if existing performance counter registry hive is consistent. Passed The performance counter registry hive is consistent. SSMS_IsInternetConnected Verifies that the computer is connected to the Internet. When a Microsoft .NET application like Microsoft Management Studio starts, there maybe be a slight delay while the .NET security check validates a certificate. Passed The computer is connected to the Internet and .NET security checks can be completed. 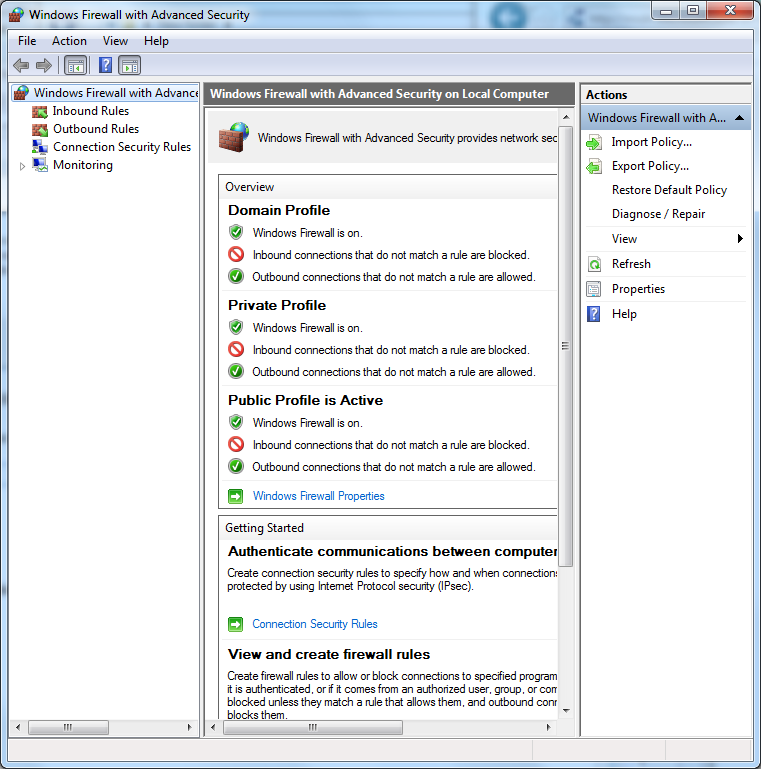 IsFirewallEnabled Checks whether the Windows Firewall is enabled. Warning The Windows Firewall is enabled. Make sure the appropriate ports are open to enable remote access. See the rules documentation at http://go.microsoft.com/fwlink/?LinkId=94001 for information about ports to open for each feature. The Windows Firewall is enabled. Make sure the appropriate ports are open to enable remote access. See the rules documentation at http://go.microsoft.com/fwlink/?LinkId=94001 for information about ports to open for each feature. Here is how firewall configuration is managed for SQL Server 2012 setup on Windows Server 2008, Windows 7 or on Windows Vista. Goto Start menu, click Run, then type WF.msc This command will open Windows Firewall with Advanced Security screen. Click on Inbound Rules from left menu. 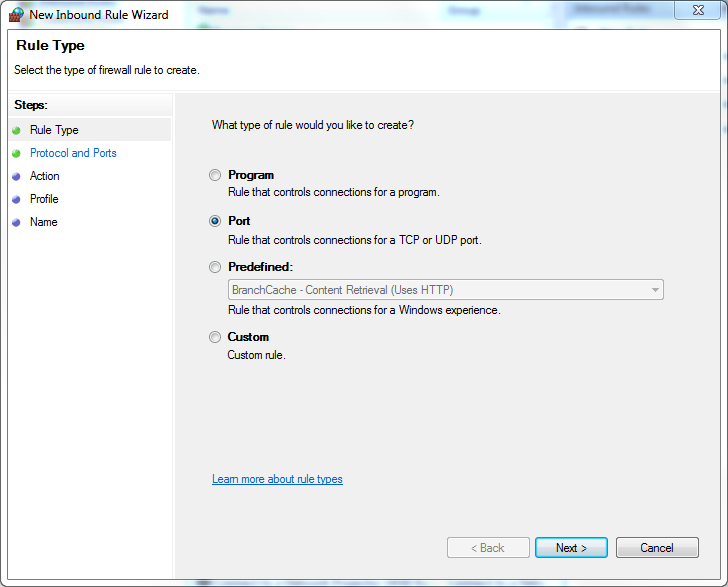 Then click New Rule from the right pane where Inbound Rules is selected. On the displayed screen, select Port option. Make sure that TCP is selected as target protocol. And You can enter port number 1433 in the specific local ports entry. Click Next buton. On the next screen the Allow the connection option should be selected. 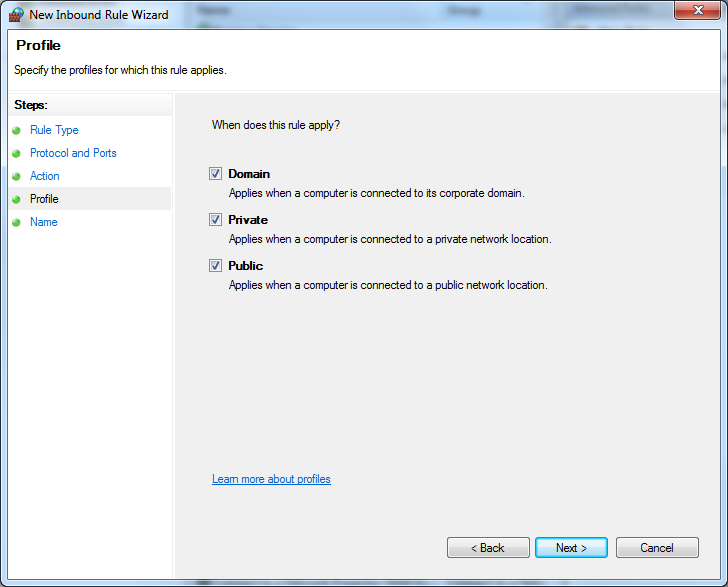 Then specify a name for the new Windows Firewall inbound rule. 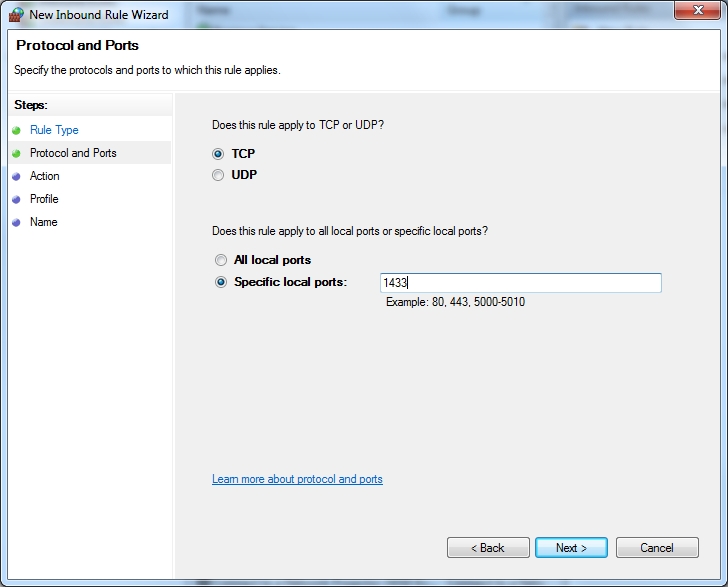 Create a new Inbound Rule for TCP Port with TCP port 2383 for Allow the connection option. 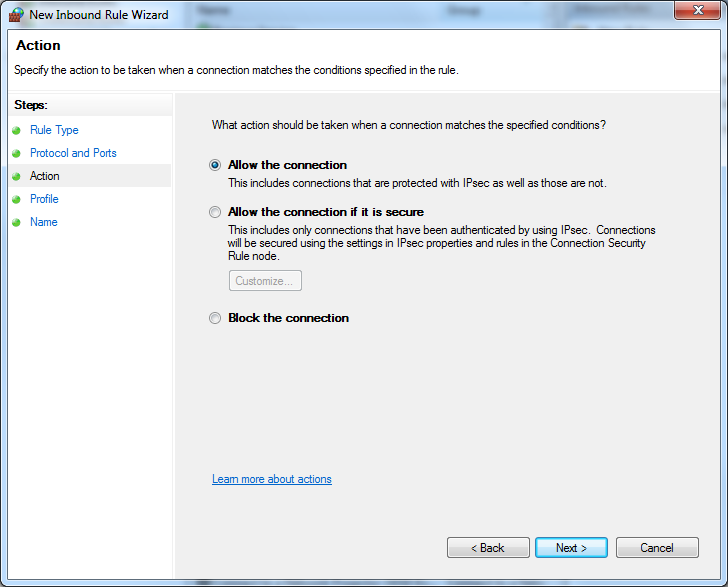 Create a new Inbound Rule for TCP Port with TCP port xxxx for Allow the connection option. 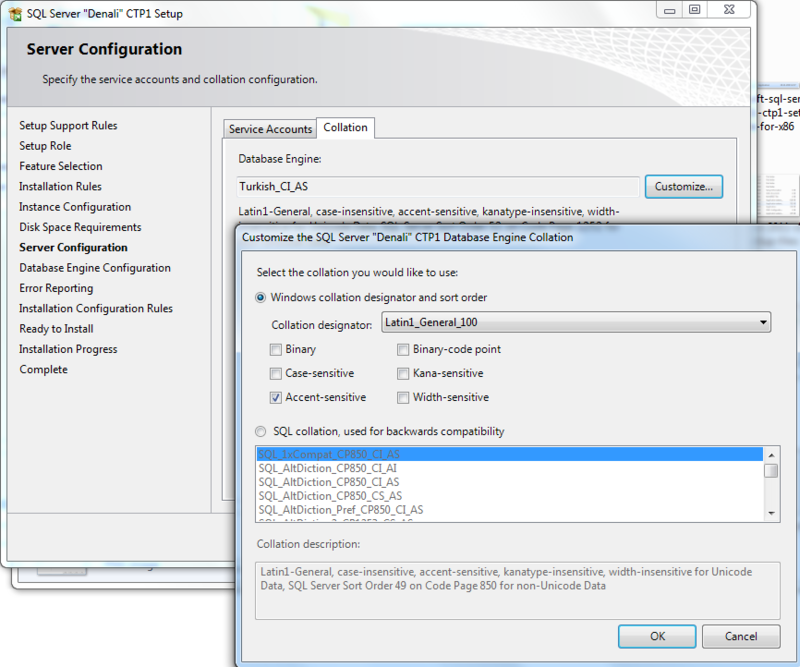 Additionally create a second Inbound Rule for TCP Port with TCP port 2382 for Allow the connection option for SQL Server Browser service. 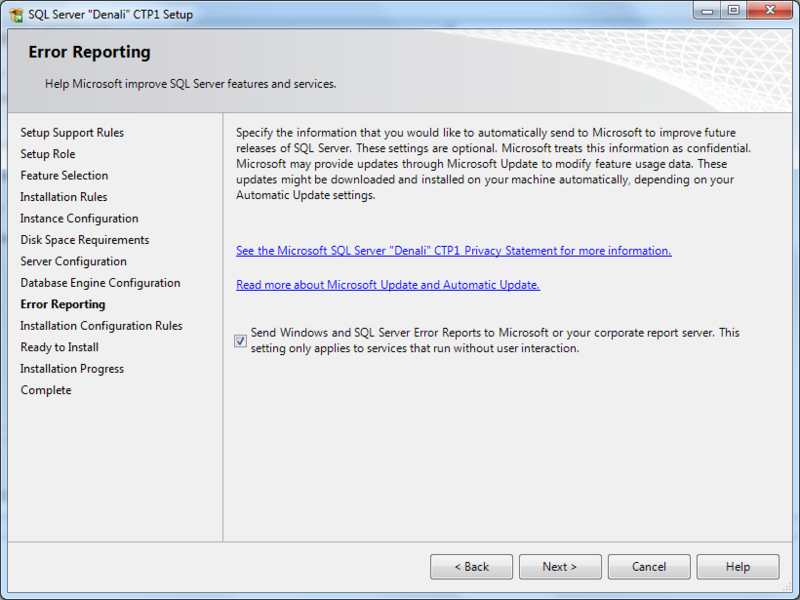 For SQL Server 2012 Reporting Services (SSRS) Windows Firewall configuration Allow the connection on TCP port 80 with a new Inbound Rule. For SQL Server 2012 Integration Services (SSIS), Windows Firewall configuration can be managed with TCP port 135. 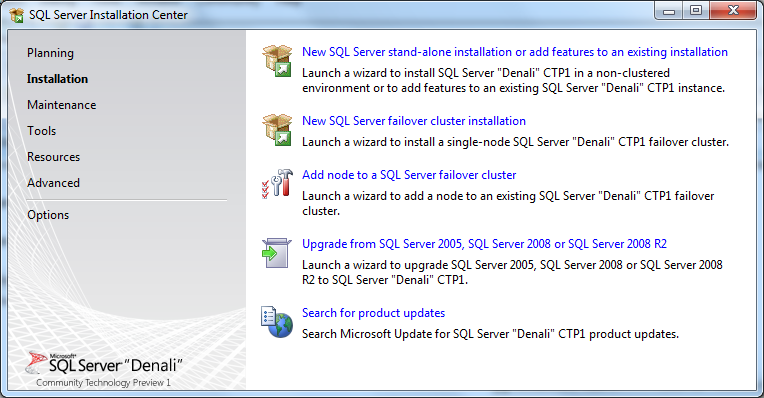 Now we can go back to SQL Server Installation Center and continue with SQL Server 2012 Denali setup process. 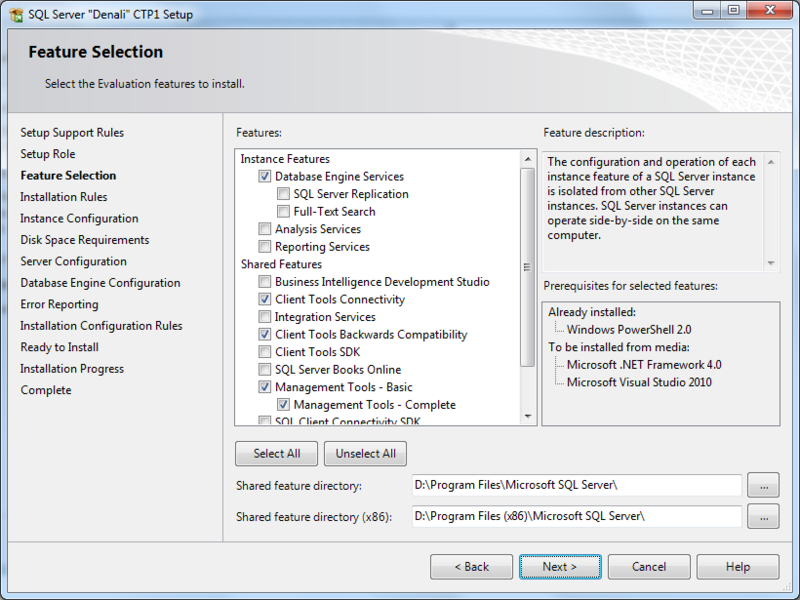 Click Next buton for selecting among Microsoft SQL Server 2012 Denali CTP 1 features. After SQL Server 2012 features selection for setup process, the installation rules are applied and gives reasons for a possible failure. 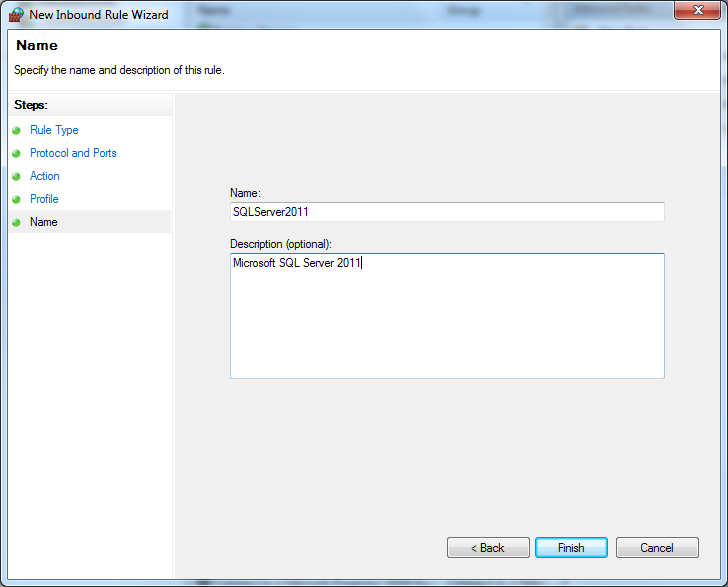 The only warning the setup wizard is pointing is about SQL Server Management Studio. 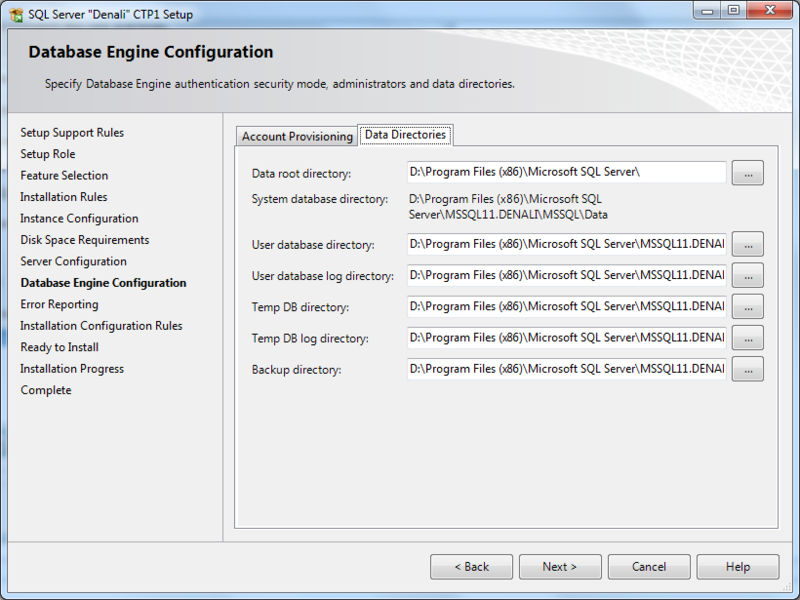 SQL Server database professional can refer to http://msdn.microsoft.com/en-us/library/bb500469(SQL.110).aspx for an official Microsoft SQL Server 2012 installation guide.